Collegiate mine rescue teams have been established in the United States, Australia and various other countries. The valuable skills gained while learning and training mine rescue at a collegiate level are universal. 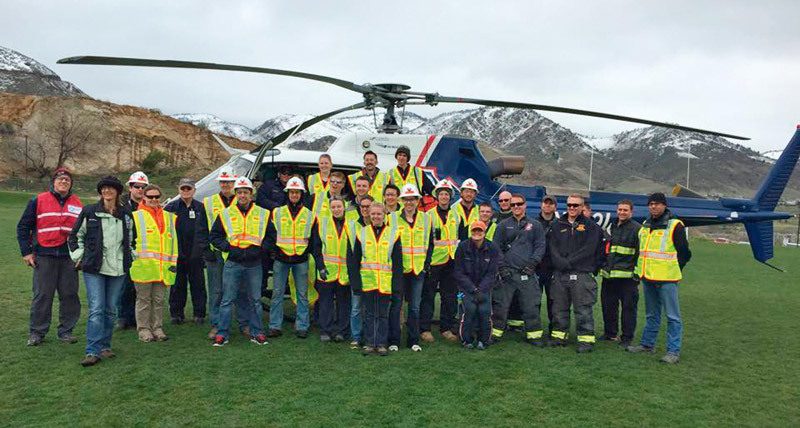 In 2016, there were nine collegiate mine rescue teams in the United States, with additional collegiate mine rescue programs being developed at different universities throughout the world, including at the Technical University Bergakademie Freiberg. These programs teach college students a safety-conscious mindset, leadership and management skills, decision making under pressure, critical thinking, teamwork, clear communication, and emergency medical skills. In addition, students build valuable networks with mining industry professionals. Fig. 1. CSM Competing in an Official Mine Rescue Contest. // Bild 1. Grubenwehrwettkampf an der CSM. In the United States, most mining regulations, including those for mine rescue, are stipulated in Title 30 Code of Federal Regulations (30 CFR). 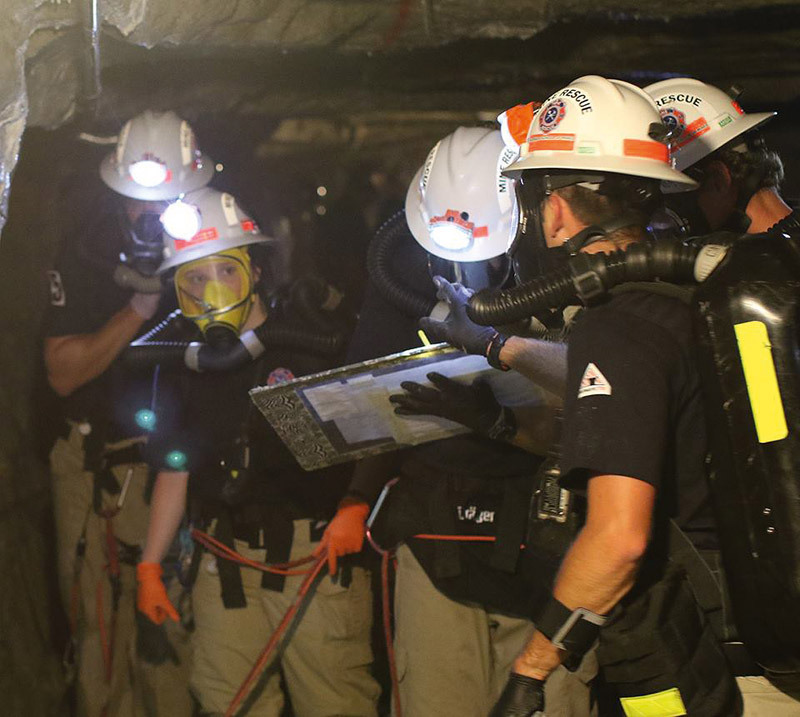 To ensure mine rescue teams are prepared to respond in the event of an emergency, 30 CFR §49.50 requires that all certified mine rescue teams participate in a minimum of two official mine rescue contests per year. These contests are broken into three categories. First, teams compete in two field exploration and rescue problems over the course of two days (Figure 1). These field problems demand critical thinking, team working and communication skills. Teams work under apparatus and explore the mine and proceed while maintaining ventilation and roof control. Teams are challenged with various objectives, including rendering first aid to victims, rescuing and transporting victims to the Fresh Air Base (FAB), ventilating the mine, sealing or extinguishing fires, and supporting ground control hazards. Communication with the FAB and the Incident Command Center (ICC) is essential. The second component of the mine rescue contests is the First Aid Competition. First aid teams compete in a simulated medical emergency scenario. Teams are evaluated on the quality of care given to the injured patient. The third component of the competition is the Technician Contest. This contest is designed to test the team’s technicians in their ability to identify and repair malfunctions or defects in any part of the gas meters or self-contained breathing apparatus used by the team. The mine rescue program at the Colorado School of Mines (CSM) was started in 2009. Two mining engineering students experienced mine rescue training while working at mining industry internships. They took their newfound knowledge and started the CSM Student Mine Rescue Organization as a volunteer, extracurricular activity open to students of any major. With equipment donations by various suppliers, CSM student activity funding and monetary donations by faculty and alumni, the students developed the collegiate mine rescue program into a large organization with two to three fully equipped, trained and officially certified mine rescue teams. The teams receive competent technical support and training by the Energy, Mining and Construction Industry Safety (EMCIS) program at CSM, as well as from the State of Colorado Front Range Mine Rescue Team, a professional team serving smaller mines in the area west of Denver. The CSM student teams own twelve fully operational Dräger BG4 self-contained breathing apparatus, complete with associated testing and benching equipment, gas testing equipment, two custom designed stretcher carts for the recovery of injured miners, technical rope rescue gear, a 16 ft. rescue trailer, first aid supplies and training equipment, and various additional equipment. The CSM Mine Rescue Organization is entirely managed by students attending the Colorado School of Mines. The organization’s officers are elected each academic year and serve a one-year term. Officers develop and execute all training plans and select the focus areas for the training. The team maintains compliance with the U.S. Mine Safety and Health Administration as a fully trained mine rescue team in the United States according to 30 CFR § 49 and other applicable regulations. Students typically train four times per month, with two evenings dedicated to theoretical and classroom training and two full days dedicated to practical training in the CSM Edgar Experimental Mine, a former lead-zinc-silver mine that is now used for teaching, research and training. Through their membership and training with the CSM Mine Rescue Team, students are trained not only in mine safety and mine rescue skills, but they learn about general emergency management. Students learn to handle non-mining related emergencies that may include traffic accidents, firefighting, medical emergencies on and off-campus, and technical rescue involving ropes. The regular practices put team members under pressure as they work on time constrained training challenges that require leadership, communication, first aid and mine safety-technical skills. In addition, students learn how to interact with public safety authorities including the police, professional emergency medical staff, firefighters, medical helicopters and various emergency management authorities. Figure 2 shows the CSM mine rescue team during a practice where students established a helicopter landing site, directed the helicopter during landing and take-off, and practiced loading a patient into the helicopter. Fig. 2. Flight for Life Helicopter Trainings. // Bild 2. CSM-Grubenwehr am Hubschrauberlandeplatz. A most valued skill that the team members develop is a safety mindset and culture. The CSM Mine Rescue Organization teaches safety in theory and practice. This provides its members the ability to efficiently analyze a hazardous situation and to identify hazards while simultaneously preventing others from putting themselves in danger. The importance of safety as the highest priority is continuously emphasized. Team members are taught to be aware of their surroundings and encouraged to speak up with any safety suggestions in their daily lives. This has led to team members identifying and reporting several unsafe situations on campus that were subsequently addressed and mitigated. The organization’s safety success has been attributed to the firm belief and development of safety culture in the organization’s members. Due to this training, the team has been able to safely complete more complex trainings such as multilevel technical rope rescues without any safety incidents. Collegiate mine rescue also develops leadership skills. All students have numerous opportunities to take on leadership roles and responsibilities in a guided and supportive environment. Students plan and lead practices and trainings, take charge of rescue teams, first aid teams and lead various other functions. Leadership opportunities are open to all members of the club. All trainings are led primarily by students under the organization’s student training officer. When the team travels to compete in mine rescue contests, the planning, itinerary, transportation and all accommodations are organized by students. These activities teach members to lead from the front and allow them to gain hands-on leadership experience. A well-established mentoring program allows younger members within the organization to grow into officer positions and other leadership roles. Faculty members at the Colorado School of Mines donate time to the organization to train interested members in successful leadership techniques. Following the leadership meetings, members are encouraged to apply new skills at upcoming practices and trainings. During mine rescue trainings, students are exposed to situations that can be stressful and physically and mentally demanding. Team members regularly train under the Dräger BG4 breathing apparatus where they spend 60 to 120 minutes completing a simulated mine rescue problem. The mine rescue team must work efficiently and under time constraints to achieve all objectives. Over the course of the problem, the mine rescue team must make decisions regarding hazard mitigation, mine ventilation, patient care and extrication from the mine. When students are pushed to make critical decisions that affect the livelihood of patients within the mine, they develop decision making and critical thinking skills. The entire mine rescue team is pressured to make a decision; however, as it happens in real life, teams are often uncertain of the correct action. Instructors regularly throw in additional surprise challenges to push the teams further. By debriefing and providing feedback at the end of scenarios, members can reevaluate decisions and learn how to resolve the challenges in a more safe and efficient manner. Fig. 3. Demonstration Loading a Patient on a Back Board. // Bild 3. Richtiges Lagern eines Verletzten auf einer Trage. Simulated mine rescue emergencies are designed to make individuals and teams think outside of the box and require teams to work together to arrive at a solution. Difficult tasks require methodically work as a team, e. g., safely loading a patient (Figure 3). During their second and third year of mine rescue team membership, students see a marked improvement working in a high stress environment. They develop conflict resolution skills and learn how to work together efficiently despite tensions. Members learn how to manage the team dynamics and are able to appreciate the importance of each contributing member. An important component of mine rescue is the training in basic and advanced emergency medical skills. Members learn how to triage and prioritize patients, work efficiently to rescue victims and prepare them for advanced emergency care. Students learn how to manage large scale, multi-victim medical emergencies and apply their skills to remain calm, stay focused and provide help based on medical priorities and within their skill levels. CSM students, through the training received in the CSM Mine Rescue Organization, have responded to numerous non-mining related emergencies on and around campus, including cave rescues, traffic accidents and day-to-day illnesses and mirror emergencies. On one occasion, two team members drove up on a multicar accident that had just occurred. The students used the medical bag they had in their personal vehicle to render first air, call for ambulance support and triage all victims involved in the accident. They helped a partially conscious woman maintain her airway open until emergency medical services arrived, possibly saving her life. In addition to these emergency response and management skills, students use opportunities to support local community events. The CSM Mine Rescue Students regularly volunteer to staff a standby medical station during various university events. Students also benefit through networking with mining industry professionals by competing in local, national and even international mine rescue contests. 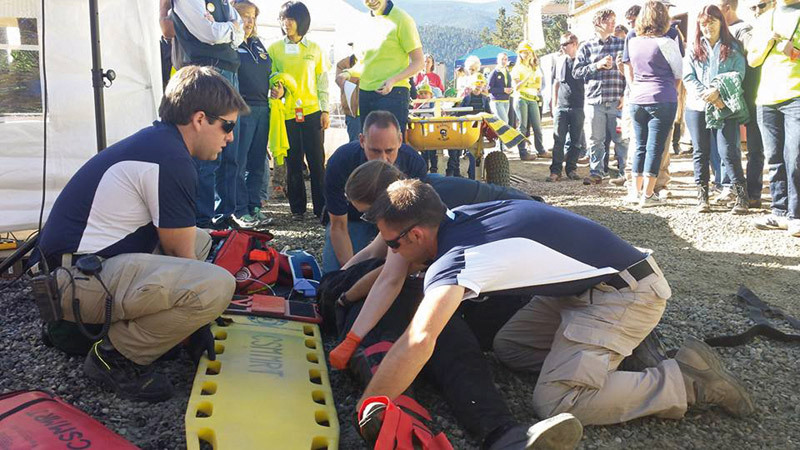 Typically, the CSM Mine Rescue Organization competes in three to four contests each year. These contests usually have 10 to 15 corporate teams. This provides the unique opportunity for the students to network with miners, engineers, safety professionals, managers, and vendor staff. All of these skills learned in the CSM Student Mine Rescue Organization are highly valued by corporate recruiters. They also keep the graduates involved with professional mine rescue after graduation and make the alumni strong supporters of collegiate mine rescue. Safety drives the mining industry. Entering the industry with a strong safety mindset gives the mine rescue students a significant advantage over other graduates. A safety conscious mining engineer who has strong emergency management and leadership skills will rise to positions of responsibility sooner than a graduate who still needs to acquire these skills. Coupling a strong safety culture with leadership and teamwork skills creates an individual who can effectively and efficiently work with others. The ability to lead a team and to communicate effectively increases the managerial potential of an employee. Critical thinking and decision making abilities help productivity and prevent errors. Combining these traits with industry networking and practical training exposure creates an individual that has the mental and physical skills to succeed. This individual will be able to function on day one of the job and learn responsibilities quickly to become a valuable asset to the company. Collegiate mine rescue develops unique skills that cannot be learned in other areas of the engineering college curriculum. Participating in mine rescue at the collegiate level teaches emergency management, teamwork, leadership and management skills, critical thinking, decision making under pressure and technical skills that are directly applicable to professional careers. Student’s first aid and medical skills may be used to save lives in accidents. The safety mindset taught through collegiate mine rescue raises the bar for the entire mining industry by bringing in miners, engineers and managers understanding the importance of safety.